This is the only known fossil of a bat fly, a specimen at least 20 million years old that carried malaria and fed on the blood of bats. A one-of-a-kind fossil shows that so-called bat flies — tiny vampire insects that survive on the blood of bats — have been parasitizing the winged mammals and spreading bat malaria for at least 20 million years, scientists report in a pair of studies Friday. "Bat flies are a remarkable case of specific evolution, animals that have co-evolved with bats and are found nowhere else," George Poinar, a zoologist at Oregon State University who led the studies, said in statement. The highly specialized parasites, some of which only dine on specific bat species, spend most of their lives crawling through the animal's fur or on its wing membranes. They often have flattened, flealike bodies with long legs, and can be winged or wingless, depending on the species. Bat flies fall into one of two families: streblidae and nycteribiidae, which are mostly found in the Eastern and Western Hemispheres, respectively. Currently, scientists have only identified nycteribiid flies as vectors, or transmitters, for bat malaria, but researchers have now learned that streblids may also be spreading the disease. In the La Búcara mine, located in the Cordillera Septentrional mountain range of the Dominican Republic, Poinar and his colleagues uncovered an ancient malaria-carrying streblid fly entombed in amber. "While no malaria parasites have been found in extant streblids, they probably occur and it is possible that streblids were the earliest lineage of flies that transmitted bat malaria to Chiroptera [bats]," Poinar writes in one of his studies, published in December in the journal Parasites & Vectors. Based on other fossils encased in amber from the La Búcara mine, Poinar estimates that the bat fly got trapped 20 million to 30 million years ago, though the range could be as large as 15 million to 45 million years ago. Given that bats go back about 50 million years, the find means that the flies have been attacking bats for at least half the time they've existed, Poinar said. 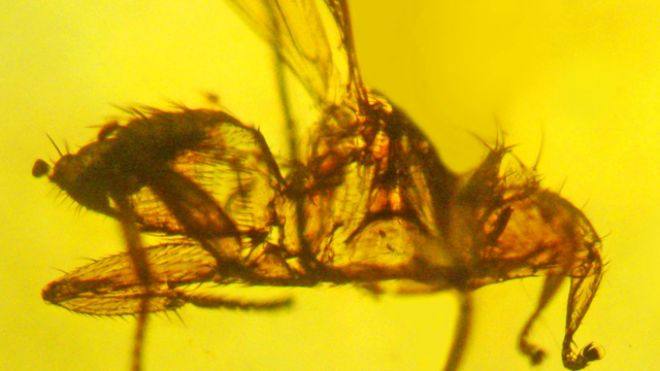 The fossil is the first ever found of streblid flies, possibly because insects in general don't preserve well, unless they are trapped in some kind of preservative-like substance such as amber; and these bat flies only leave their bat to mate — this is probably what the bat fly was doing when it got trapped in sap, Poinar said. “I could not find any fossil record of nycteribiid bat flies so this would be the first fossil record of a bat fly,” Poinar said in an email to LiveScience. Poinar's second study, which details the fossilized bat fly's physiology, is published in the February issue of the journal Systematic Parasitology.